The Glenwood and Rifle captains meet in the middle of the field for the coin toss to start the game on Friday night at Rifle High School. 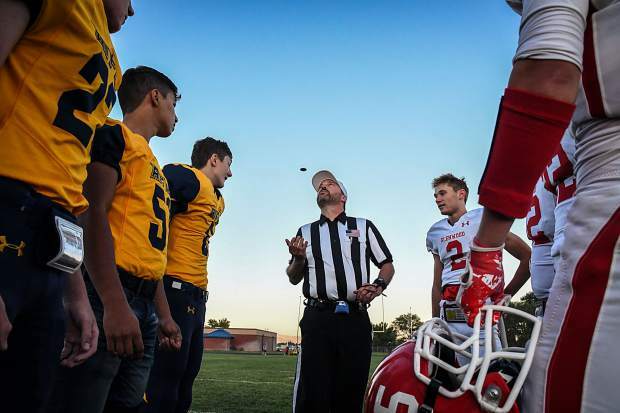 Playing in front of a standing-room only gathering at Bears Stadium in Rifle, the Glenwood Springs Demons and Rifle Bears got together for their annual clash on the gridiron. For the 8th straight year, the Bears came away with bragging rights, toppling the Demons 27-14 in a hard-fought affair. Both teams were unable to move the football on their initial possessions of the game, but the second time the Demons touched the ball proved to be a charm. With 5:37 showing on the first quarter clock, senior running back Miguel Herrera broke free through the right side of the Rifle line and out-raced defensive back Levi Warfel to the end zone on a 79-yard touchdown burst that gave the visitors a 7-0 advantage after the PAT by senior Sebastian Torres. Rifle took the ball following the kickoff on their own 10 yard line, and what was to follow could have been a big momentum swing for the Demons. Deep in Bear territory, Glenwood linebacker Sam Fitzwilliams pounced on a fumble by Rifle running back Warfel, setting the Demons up with a golden opportunity to go ahead by two scores. But the scoring hopes slipped through Glenwood’s fingers like grains of sand as they fumbled the ball right back to the Bears a couple plays later. Rifle capitalized on the turn of a friendly card when running back Tanner Vines rambled 52 yards down to the Glenwood 11 yard line. Warfel cleaned things up from there with a 10-yard scoring run. The PAT by Eddie Ruiz was good, and the rivalry game was knotted at 7-7 as the opening quarter came to a close. Rifle went up on the scoreboard with 6:47 showing on the clock before halftime. With their misdirection running game grinding out impressive chunks of yardage, the Bears methodically marched down the field toward the west end zone before Vines broke several Demon tackles en route to a 30-yard score for a 14-7 lead. With coach Engle inserting junior quarterback Dylan Albright into the backfield, the Demons caught a big break when Albright’s pass near the right sideline opportunistically popped out of the arms of one Glenwood receiver and into the waiting arms of senior Wyatt Ewer, who promptly out-raced all Bear pursuers 60 yards to the end zone to tie the game at 14-all. Rifle took the lead rior to halftime as quarterback Holden Stutsman and fellow junior Talon Cordova would pop 20 yard runs on the Demons. From 11 yards out, Warfel cashed in a touchdown for the Bears and the score stood at 21-14 in favor of Rifle on a beautiful Homecoming night. Rifle got the ball to start the second half and ate up nearly six minutes of the clock behind the rushing of Vines, Warfel, Cordova, and Dalton Pruett. There were no points to show for the effort though, as the drive stalled on downs at the Glenwood 39 yard line. Glenwood then put together a similar drive of its own, only to see things end on a failed fourth down attempt at the Rifle 33 yard line. Next Friday night, both Glenwood and Rifle will take to the road. For the Bears (4-0), another rivalry game is on tap as they travel just up the interstate to take on the Coal Ridge Titans in a 2A Western Slope League tilt. Glenwood (1-3), heads over the mountains to take on the always formidable Roosevelt Roughriders.